H. Upmann by AJ Fernandez is unlike any other H. Upmann you may have smoked in the storied brand's stable of premium cigars. Blended by the remarkably talented A.J. 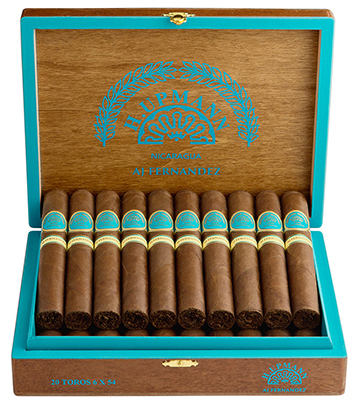 Fernandez and flawlessly handmade at his factory in Esteli, Nicaragua, the H. Upmann by AJ Fernandez is a medium- to full-bodied, robust, and distinctly flavorful cigar with an even burn and perfect draw. A gorgeous Ecuadoran Sumatra wrapper covers Nicaraguan Criollo '98 and Dominican Piloto Cubano filler tobaccos bound in Nicaraguan Corojo '99 leaf delivering tasty notes of cocoa, sweet cedar, cream, coffee, roasted nuts, and a gentle spiciness.